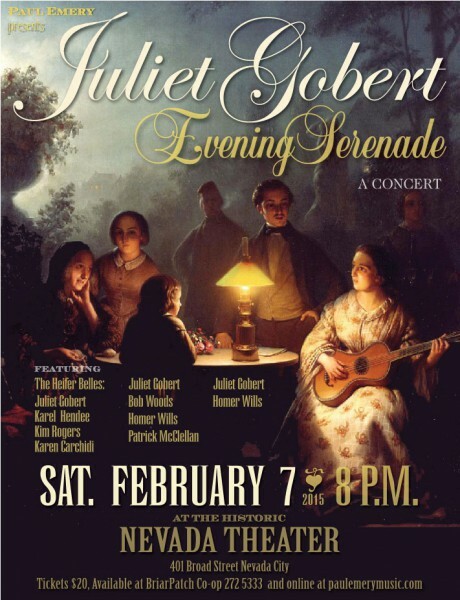 Juliet Gobert grew up in a home with young parents who spent their days and nights with the phonograph playing Chuck Berry to Bob Wills, and grandparents whose idea of a fun evening was sitting around the kitchen table with grandpa playing the mandolin while everyone sang along. Juliet worked at Gelb Music for ten years, dreaming of some day writing and singing her own songs. During this time Juliet also worked at Bay Shore Studios as studio back up vocalist, and began singing back up in several local “garage bands”. Juliet put music on the back burner when her daughter was born, moving to the California Gold country to raise her family Juliet wound up in Nevada County, a community of artists. Surrounded by musicians, artists and actors, seriously, everywhere, she couldn’t help but be inspired to follow her dream of writing and singing. Since the late 80’s Juliet has been playing and working with local musicians, and singing back up with and opening for well known artists including Nina Gerber, Roger Hodgson of Super Tramp, Kenny Edwards of The Stone Poneys, Paul Barrere and Fred Tackett of Little Feat. Juliet has performed at some of California’s premiere music festivals and venues: Keystone Palo Alto, Strawberry Music Festival, The Kate Wolf Festival and Kentucky Mine Music festival, Grass Valley Center for the Arts, The Nevada Theater, and the Auburn Event Center. Juliet is currently performing as a duo with veteran harmonica player Homer Wills (The Mavericks, Jerry Jeff Walker, Guy Clark, Townes Van Zandt), and as a member of the rockabilly/zydeco band “Swampbilly”, and she is lead vocalist in “The Heifer Belles”, performing her original songs. This entry was posted in Past Shows and tagged Juliet Gobert, Nevada Theatre. Bookmark the permalink.